Episode Twenty-two of Mike Daisey’s All the Faces of the Moon succeeds largely based on its cohesion. While I truly love the acrobatic leaps from subject to subject in Daisey’s work, at times the nonchalant stringing together of loosely related topics can be exhausting – like a lengthy Wikipedia-surfing session in auditory form. Here, two recurring components filter into each “entry,” which makes for a more unified listen and also allows Daisey to build up the mythic significance of each of these things. The poem referenced in the quote above is one of these elements, but I will get to that a little later. From almost the get go, towers dominate the imagery of this episode. Whether he’s alluding to the tower in Stephen King’s Gunslinger books, name checking The Lord of the Rings (another series of books where towers are highly significant), or simply having some fun at the expense of the much-delayed Freedom Tower in downtown Manhattan, Daisey ensures that the specter of his own tower – the “ladder” made of light that reaches up to heaven from the World Trade Center – is visible from all vantage points. Because I attended the performance of the final episode in person, I know that Daisey’s tower is the centerpiece of the final action. Like the tower in The Gunslinger or like the Tower of Sauron in The Lord of the Rings, it represents the unknown enemy whose presence is felt in all quarters of the story. Daisey devotes this episode to giving the tower itself an appropriately ominous charge. He mentions the Tower of Babel and points out that most of the mythology around towers is about their falling. While he doesn’t dwell on the towers that fell in Manhattan 13 years ago, he does takes time to examine – often hilariously – the wonky mythology surrounding the “Freedom Tower,” which despite many press releases has yet to shake its original inappropriately euphemistic name. He sees it as a kind of symbol for the new New York in that it took over a decade to complete, it looks nothing like its original design, it’s basically empty, and it’s a cheat – if you don’t count the antenna it’s not actually 1776 feet tall. Daisey the only explanation Daisey can offer in response to these short comings is that the tower was obviously built by a union of horny, mentally deficient dolphins in robot suits. When Daisey’s mystery antagonist appears again, we find him operating out of a metaphysical office situated somewhere in the “null space” above the top floor of the Freedom Tower. Though we still do not learn his identity, we overhear him brutally dress down and then kill Thomas Edison, whom he recruited to help cause the explosion back in episode 10. I say kill but it is clear that both of these men are already dead – so whatever death is to two already dead guys. Regardless, it’s an excellent show of status on Daisey’s part. Not only has his villain orchestrated everything in the story thus far, he is willing to put even an esteemed personage like Thomas Edison to the sword without a second thought. This doesn’t bode well for Daisey’s wife, Jean-Michele, who according to mystical omens is being held prisoner in the tower as well. We then flashback to earlier this summer and spend some time with Sabrina. She died in the explosion across from Zuccotti Park, but before that she was hired by Larissa Tokmakova to photograph a series of 29 paintings. Not the paintings the artist created for this show. No, these are the ones Jack and Mary Jane discovered and that have apparently been shaping the events of the narrative. It seems like Daisey’s magic teacher, Phil, is also working with the big bad, who commissioned these paintings. With Tokmokova’s appearance in the narrative, all the meta multimedia mirrors begin to fold back in on each other. 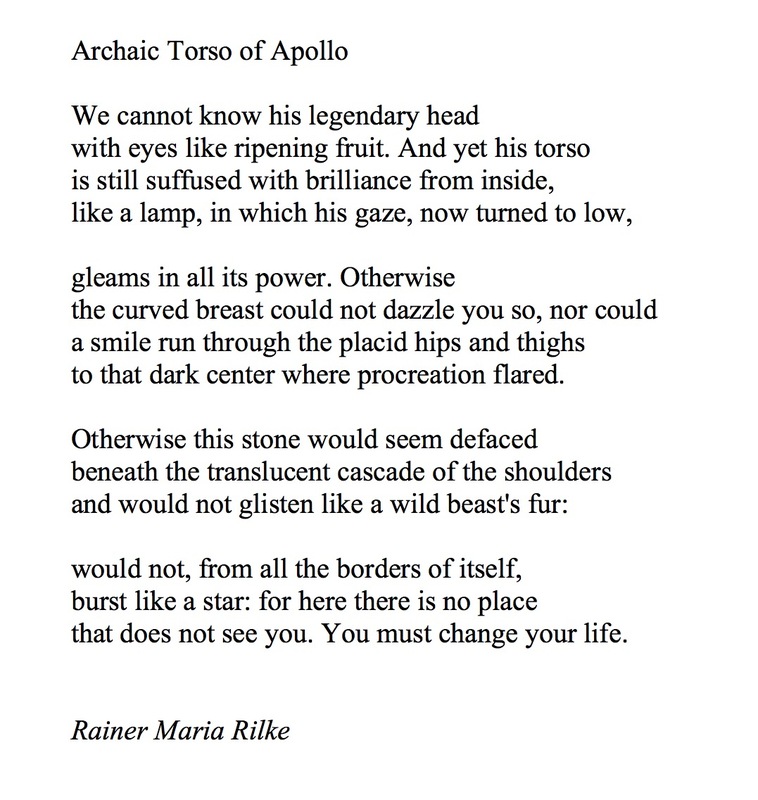 The poem that Daisey references at two key points in this episode, “The Archaic Torso of Apollo” by Rainer Maria Rilke, is ostensibly about an incomplete ancient sculpture of Apollo where only the torso remains. So the sculpture is the subject of the poem and the poem is the subject of Daisey’s performance. Daisey’s performance is, in a way, the subject of Tokmokova’s paintings, and Tokmokova’s paintings are the subject of Sabrina’s photographs. Like the old lady talking about the Universe says in Stephen Hawking’s book, its tortoises all the way down. I have never been great with poetry, so I “phoned a friend” on this one. Dr. Geoff Klock is a teacher, author, and contributor to this site, as well as a pop culture guru in general. He earned his poetry street cred at Oxford. What makes this a good poem, he says, is the notion that the viewer has to invest some imagination when it comes to the statue. “The torso seems extra impressive because it is missing a head and other parts,” he says, “and so you have to pay more attention or see things that are not there to extrapolate the position and expression. And because the head is not there, you imagine it, which means it is looking everywhere – even right at wherever you are.” In the context of the episode, I think this is great fit with the tower which is visible from everywhere. You can see it and it can see you. Daisey speaks persuasively about this poem and how it influenced the way he thinks about the ways the ways we interact with art. We let it into the “corridors of ourselves,” he says and then decide what things we “allow it to touch.” An experience with a story or a piece of art is like having the “furniture” inside you rearranged. You don’t really discover it until later, when you wonder how a certain piece of you ended up somewhere else. According to Daisey, he was good and redecorated by this poem. The poem and the episode are both reflected beautifully in Larissa Tokmakova’s stunning painting for this episode; truly one of the best of the series. 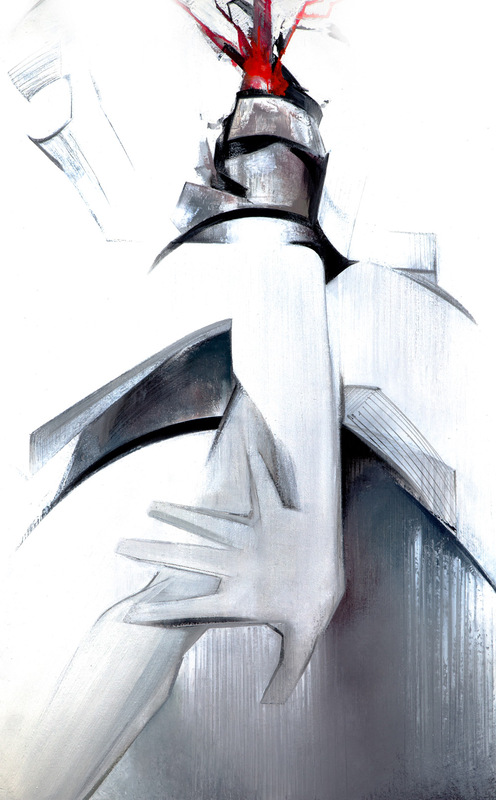 Tokmokova’s tower is a chaotic affair; built, like the Torso in the poem, out of negative space and from a tumble of ghostly, white-on-white human limbs. True, there is a dark structure somewhere underneath, but its foreboding majesty and the explosive angst it engenders are mostly made from the parts of ourselves we put into it. Like the absent godhead of Apollo, the Tower is only as awesome and terrifying as we imagine it to be.